In the high strung, fast-paced lives we seem to find ourselves in almost daily, it’s no wonder we’re willing to shell out big bucks for a single day of relaxation at the spa. Thanks to a new innovation, now you won’t ever need to leave your to get that experience again. Spa capsules are an all-in-one option for therapists to offer a wide range of treatments in one compact unit. International Spa Supplies will be displaying one of its multiple-treatment capsules at its stand in order to show visitors its ease of use and suitability for hotels without the space or budget to provide a full spa facility. 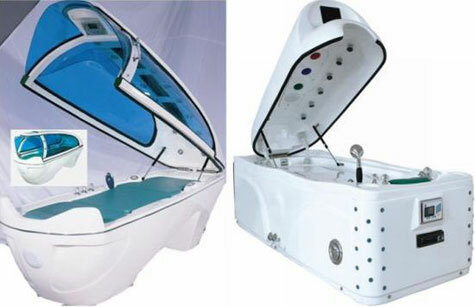 Features of the spa capsule include an LCD panel showing preset programmes, adjustable steam therapy, infrared therapy, 14 Vichy shower heads, a cooling face breeze, aromatherapy reservoir, music facility and capsule remote control.Space saving technology and affordability are its USP.price is £10,000. Another model features a hydrotherapy tub with detachable mattress for clients to lie on top of the tub to receive a range of spa treatments, 12 Vichy shower heads, voice activation, colour therapy lights, ozone therapy and a built-in TV screen.price is £18,000. great site and article. i never seen this be4.